A great price shouldn’t mean compromising on quality, which is why our new range of Essential Forklifts give you everything you expect from Kalmar. 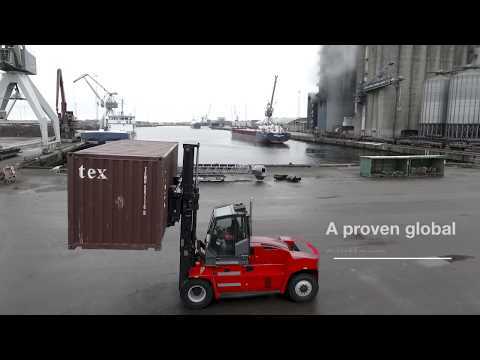 A forklift built on a tried and tested, reliable and robust platform that is made for the most demanding applications. With lifting capacities from 10-18 tonnes, they are ideal for containers, steel and wood. We know that availability and reliability are key to your operational success, so we have built our new range of Essential Forklifts on our latest platform, which has been already been used in over 10,000 Kalmar machines. You will benefit from a highly stable and durable chassis, common electrical systems for easy trouble shooting and a colour HMI screen for improved diagnostics. 2 different engines with two different ratings. You get a choice of lifting capacities – 10, 12, 12.7, 14, 15, 16 and 18 tonnes. You also get a choice of load centring positions depending on the lifting capacity chosen. You get a choice of three different masts, all with clear view. A duplex standard mast, duplex full free mast, or a triplex full free lift mast for a lower closed mast height. You get three different cabs to choose from. A fully enclosed cab, with aircon as optional, a partially enclosed cab or a fully open cab. There are two different mounting positons for the Essential Cab. You can either mount the cab in the standard position or, for increased visibility, mount the cab 300mm higher. You have a choice of two highly efficient engines with two different ratings – the new Volvo 105kW or reliable Volvo 129/kW. Both come with a choice of ratings, either complaint with Stage 4/Tier 4 Final or Stage 3A/Tier 3 emissions standards. You might also choose one of our four Kalmar Care service contracts to maintain your machine, or consider Kalmar Genuine Parts. Kalmar Genuine Parts are high quality parts that will always meet, if not exceed manufacturer's standards, making sure that you get the right part, first time.